A lot of you probably saw your BGP routers go crazy on Friday 27th of August in the morning, especially if you happened to have a CRS (or another router running IOS-XR, like a C12k or ASR9k) in your (or a near) network. RIPE and Duke University decided to experiment with Quagga's BGP and the result was to make some routers reset their BGP sessions, because they were receiving malformed BGP update packets. Malformed packets were generated by other routers in the middle, not by the Quagga BGP daemon where the experiment started. According to BGP's RFC, the "3/1" in the error message translates to Code "UPDATE Message Error" and Subcode "Malformed Attribute List". 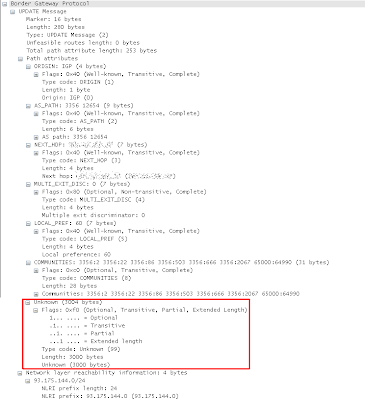 Wireshark offers an "easy" way to decode packets in ASCII format, as long as you feed them in the right way. The following perl script (which is based on my previous ciscodump2text) will convert the BGP packet included in the above Cisco error messages into a format that can be understood by Wireshark's text2pcap. # so a pcap file for Wireshark can be created at the end. # You have to remove any extra characters included in the error messages. # along with this program. If not, see http://www.gnu.org/licenses/. By using as input a text file with the BGP packet as shown in the original error message, you'll get an output text file ready to be processed by text2pcap. The format the source text file (test-bgp.text) should have is the following. You just need to erase all extra characters from the original error message and it's ready. The actual data starts after the "Bad attributes" string. Keep in mind that the packet might have been spitted in more than one messages, like in the above case. Just remove the initial characters from every line and it'll be ok. Note : right now, only one packet can be processed. 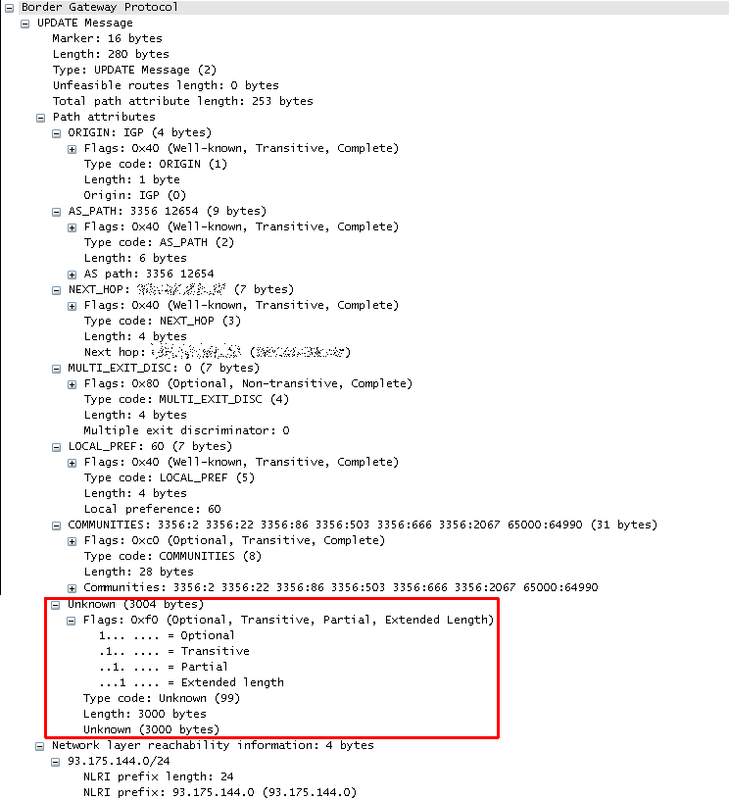 The length of the BGP UPDATE message has been defined as 280 in the BGP header, having 253 as total path attribute length, so something went clearly wrong. This unknown attribute should have a length of 3000 bytes as defined in its length attribute, but it was only 184 bytes if you count the octets from where zeros start (after 0x0BB8) till the end. From this number comes 188 (184 + 4 for Flags/TypeCode/Length), the number that's included in the initial error message. So, the length of the unknown attribute has been defined as 3000 into the packet, which is 0x0BB8 in hex. If you somehow remove the first octet, then it becomes 0xB8, which is 184 in decimal. If you add the 4 extra bytes (Flags, Type code, Length), then it becomes 188 and the sum of all attributes becomes 253, which is the one shown in the packet too. In reverse order, if you calculate the supposed total path attribute length in case all attributes were correct, then it should be 3069, which is 0x0BFD in hex. If again you somehow remove the first octet, it becomes 0xFD (253). I guess, in general anything larger than 0xFF (255) would have caused the same issue too. Cisco issued an advisory after some hours, providing fixes for its IOS-XR software. NOTIFICATION messages are sent in response to errors or special conditions. If a connection encounters an error condition, a NOTIFICATION message is sent and the connection is closed. A NOTIFICATION message is sent when an error condition is detected. The BGP connection is closed immediately after it is sent. Error checking of an UPDATE message begins by examining the path attributes. If the Withdrawn Routes Length or Total Attribute Length is too large (i.e., if Withdrawn Routes Length + Total Attribute Length + 23 exceeds the message Length), then the Error Subcode MUST be set to Malformed Attribute List. There is also a lot of discussion happening regarding the notification and reset thing after this event and draft-ietf-idr-optional-transitive seems quite interesting. Is there a chance by creating "dummy" and large attributes to cause memory issues on BGP routers?